From Mysterious Reviews: This hard-hitting suspense novel is populated with hard-edged characters, the remote South Dakota setting just about ideal. The mystery surrounding the dead man -- why him, why there, why now -- is well-plotted. The most significant drawback (for some readers) will be the pervasive use of R-rated language by most of the characters. 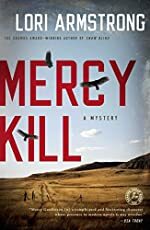 Synopsis (from the publisher): Former Black Ops army sniper Mercy Gunderson isn't adjusting well to the laid-back rhythm of civilian life on her family's ranch in South Dakota. To fill her time, Mercy accepts a temporary bartending gig at a local watering hole. Yet her attempts to settle in back home are tested when Titan Oil, a Canadian company proposing to run an underground pipeline through Eagle River County, sends Jason Hawley, Mercy's former army buddy, to the area to convince ranchers to get behind the project. While local business owners support the pipeline, Hawley's presence riles the landowners, and Mercy is torn. After ugly threats and multiple altercations escalate tensions in the county, Mercy discovers Hawley's brutally mutilated body in the bar parking lot. When it appears Sheriff Dawson cares more about campaigning for reelection than investigating the case, Mercy vows to find Jason Hawley's killer—even if she has to run against Dawson for sheriff to ensure justice is served. But Mercy soon learns her former military pal had plenty of secrets. Her search for the truth brings unwanted exposure to the county's dark side and risks deadly repercussions for the entire community.